Savvy Spending: JCP: $10 off $10 purchase coupon giveaway, plus possible $100 off or even $500 off! JCP: $10 off $10 purchase coupon giveaway, plus possible $100 off or even $500 off! JCPenney is once again hosting a coupon giveaway! On Thursday 11/23, you can possibly win a $500 off $500 purchase coupon! There will also be the chance to get a coupon for $100 off a $100 purchase or a $10 off a $10 purchase coupon. 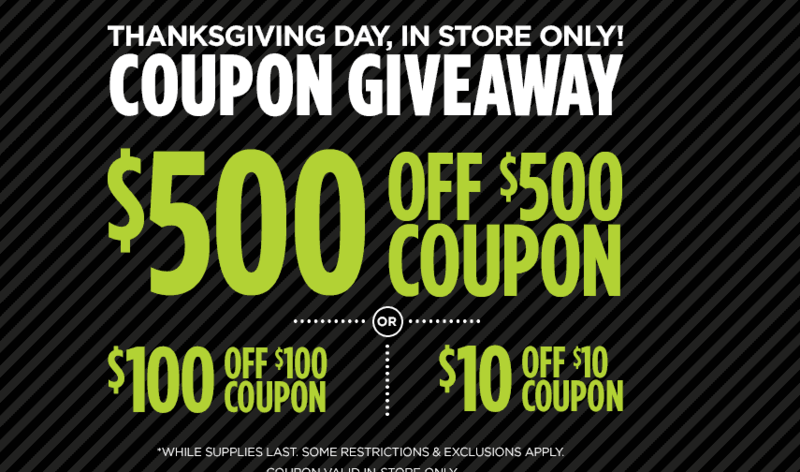 Coupons will be given out November 23rd and will be only valid on the 23rd and 24th; in-store only and while supplies last. You may want to call and see what time your store is opening on Thanksgiving. Will you be one of the people in line to snag a coupon?